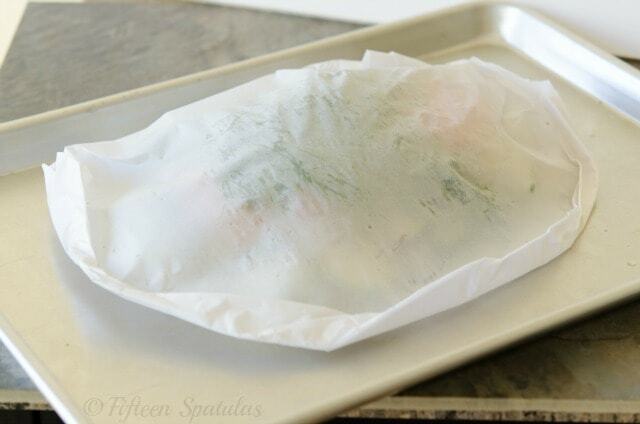 Salmon en Papillote is an easy and satisfying recipe to make for dinner. So flavorful and aromatic! Lately I have been craving simple things. For my sanity’s sake, I think. I don’t know what it is, but it seems life is just hectic right now for everybody. Is it that time of year? I don’t remember it being this nuts last year! But a quick visit on Facebook is laden with statuses about how busy and tired everyone is. Right now I’m in the middle of 4 straight weeks of conferences and a wedding, so I count myself in that crowd. All I can say is thank goodness simple can still be delicious when it comes to food. If that weren’t the case, I think we’d all burn out and not eat (okay, we’d go out for food). But this recipe is one of the easiest I know to prepare, and also one of the most incredible. Good things happen when you seal a bunch of ingredients in a bag and let their aromas and flavors play together. Quite honestly I’m always taken aback every time I make this recipe and remember how delicious it is. You can make individual parchment packets for everyone in your family and bake it all at the same time, or if it’s just you and your significant other, you can bake a two person portion in one packet (that’s what I did here). Seal it up by repeatedly folding over the parchment, making sure the packet is well sealed. You don’t want any steam escaping because that’s an important part of cooking the fish. Feel free to play around with the ingredients you put in here. Sometimes I do mahi mahi, snapper, and other fish, and certainly you could use other vegetables as well. 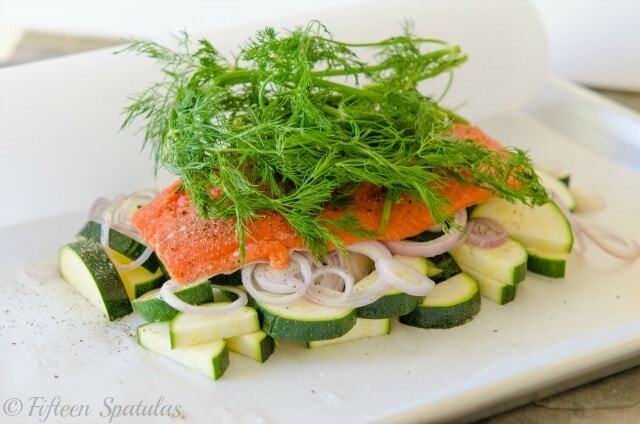 Cut long rectangles of parchment paper for however many servings of fish you plan to prepare. I usually just do one long rectangle for my husband and I to share. 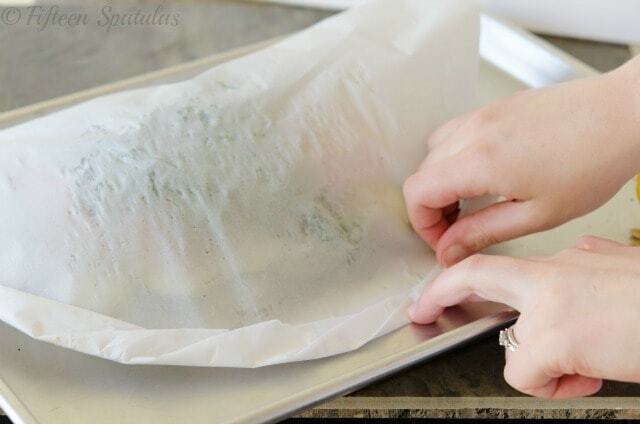 Lay the parchment paper on a sheet pan, and lay the zucchini and sliced shallots on one half of the paper. Season liberally with salt and pepper, and toss it well with your fingers to coat evenly. Add the salmon, and season it with salt and pepper as well. 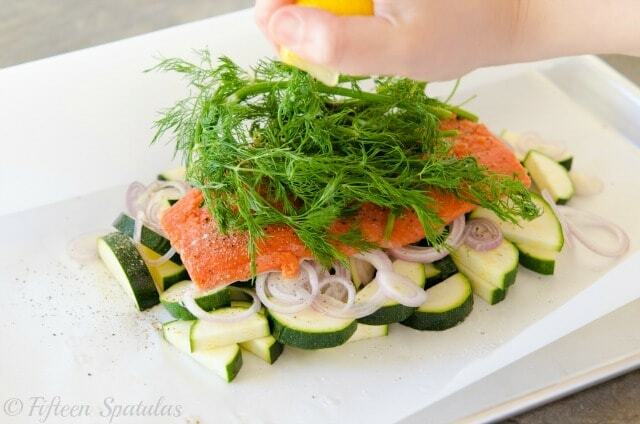 Throw the dill on top and squeeze the lemon juice evenly over the ingredients. Seal the parchment paper well by repeatedly folding little sections over each other, taking care to make sure it is well sealed. You don’t want any steam to escape. Bake for 15-25 minutes, depending on the thickness and size of your salmon. If you have a thinner salmon, bake for less time, and if you have a thicker salmon, aim for the 25 minutes. Tear open the parchment paper at the table, enjoy the aromas, and dig in! Enjoy. 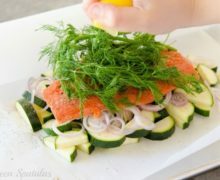 I am SO happy that you posted this recipe…I LOVE salmon in parchment paper!!! The first time I had it was at an auction, and it’s the best salmon I’ve ever eaten to date. I’ve made this myself once before as well: I cut slits into the salmon then tucked pieces of fresh thyme inside, and drizzled some garlic butter over the top. It was really good. Gave it a go, and really liked it. This has to be one of my new favorite cooking options. So glad you enjoyed the dish! !